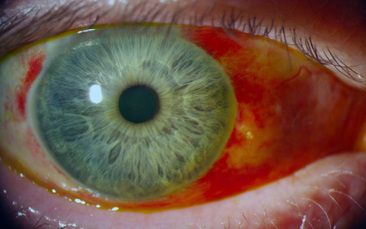 Sub-conjunctival haemorrhage is a very common cause of red eyes. It is caused typically by a sudden spike in blood pressure most commonly caused by stress, both physical and mental, although it can be a sign of underlying vascular illness such as high blood pressure. The condition is self-limiting and depending on the severity should resolve within a few weeks. The conjunctiva is a clear film of tissue which covers the white surface of the eye ball and the inner surfaces of the eyelids. It's main purpose is to secrete the mucus part of the tears to help with wetting of the ocular surface, although it also helps to prevent infection of the orbit and eyeball as well as preventing any foreign bodies getting behind the eye. It is also the tissue that becomes infected in conjunctivitis. The white part of the eye is well served by a small capillary network of blood vessels which are very delicate. If there is enough stress put on these vessels in the form of blood pressure then they will pop, thus filling the fluid filled cavity between the eyeballs surface and the conjunctiva with blood. It is important to remember that these haemorrhages DO NOT cause any symptoms of pain or sight loss although they can give a feeling of irritation or dryness in severe cases. 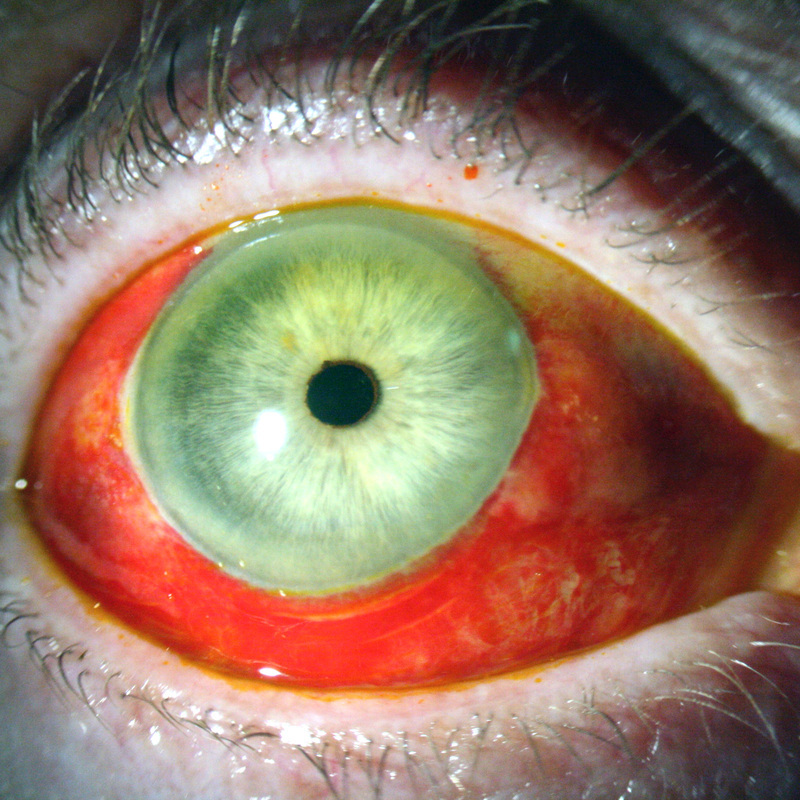 Quite often the patient will be told by someone else that they have a red eye, unless seen in a mirror the patient can be totally unaware of the condition. The haemorrhage can be quite large and create a very red eye that can look very menacing and worrying, or they can be quite small and localised giving the impression of a small injury. 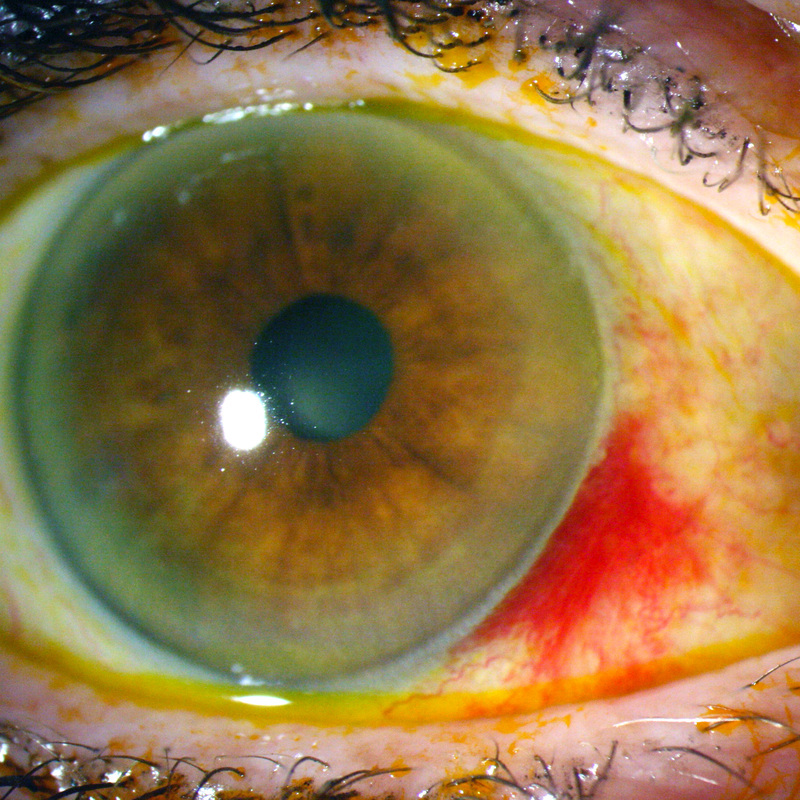 The blood from the initial leakage will slowly begin to be drained by the ocular tissues, the time period for which will vary according to the severity of the initial bleed. 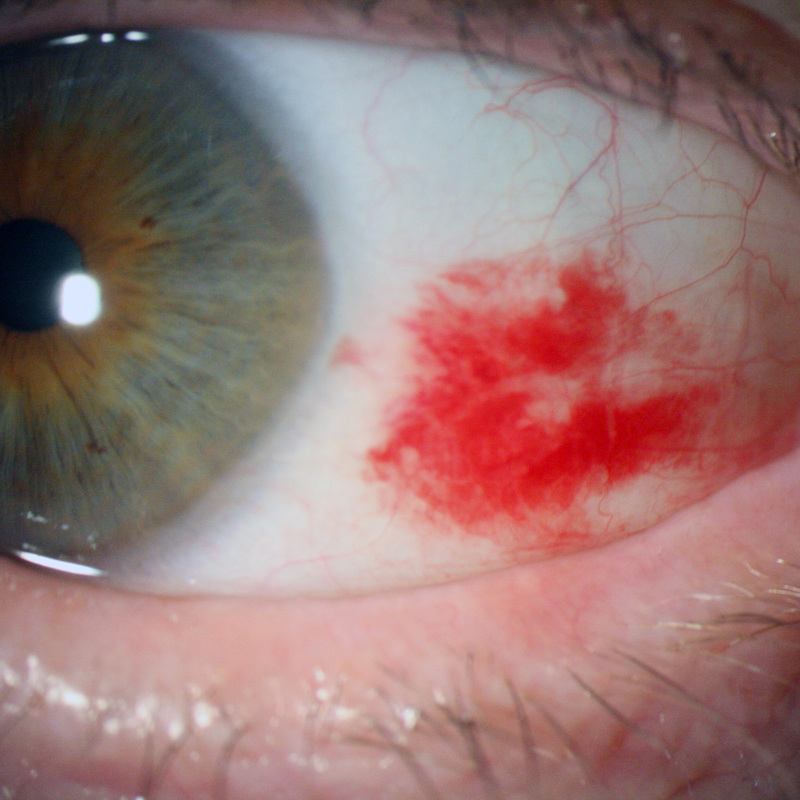 Small haemorrhages can resolve within a few days but larger more diffuse bleeds can take up to a month to fully resolve. The occasional sub-conjunctival haemorrhage is nothing to worry about and you can often pinpoint the time with which it may have happened. Perhaps you were lifting something heavy or had a coughing /sneezing fit recently or had a blunt injury to the eye? Other causes could be medication; are you taking blood thinners such as warfarin or aspirin? Stress can be a cause of these haemorrhages as can blood pressure, so if they are occurring regularly it is best to seek advice from a professional. If you are unsure in any way about your red eye, please book in to see one of our Optometrists who will be more than happy to advise you of the best course of action. Please see the Emergency Eyecare section for more information about how to book an appointment.